When I set out to take a sabbatical there were two reasons. The first was a lot of what Walker Percy wrote about: there was a moment where I fell through the ventilation shaft and landed in green house with a mentally ill woman who helped me get my strength back. Except it wasn’t a woman it was a elderly physician with a peculiar need to laugh out loud who took me to Africa and enjoyed watching my world get turned upside down. Having slept with Fred Stone for three weeks, beginning each day by seeing him and wondering if he was still breathing I think I might have preferred . . . well, let’s leave that one alone. But the effect was the same. My world was shaken, the fantasies I nurtured where contradicted; the life I had crafted was being stripped by one village full of suffering people after another. Having returned to this again and again my ability to use the old definitions were slipping away, what Eliot called the old dispensations were no longer satisfying. Mostly though I was being grounded. When I shared that with Kathy it became transparent that if such change were to happen, we would need to see it together. The life I had crafted had a few aspects were she was shall we say a part. So the sabbatical is intended to be a moment where we try to make sense of the world where there are giants afoot. Yet, the bigger theme, and bigger question is one of abiding. As I shared with you before I had come to believe that abiding meant staying put, digging in, remaining in a place for the long haul. The quiet intent was to use the sabbatical to explore a theme that would let me stay in a church more than five years- or to simply stay anywhere more than five years. My intent was to reflect upon the charge of Jesus to abide as a means of finding the secrets of staying put. Much to my chagrin all the exegesis I have done suggests that abiding has nothing to do with digging in or staying put, but everything to do with being faithful in the midst of change, being true, finding peace in a fluid world. Don Klug spoke the truth to me the other day and I didn’t want to hear it. A good elder does this for pastors. They do other things as well, but what he said was: this is a different church from when you came. What I didn’t want to hear is that I had changed it. I am still a bit nervous about that. I want to say that the church changes and grows, is pruned or made other by the power of God, not me. But that is a lot of the fear of the promise land. What if the fears of the Israelites was not that it was going to be hard, but that they would be the ones to mess it up, make the promise land less than promising? This is the great thing about living a life in your head, letting your ideals percolate and rumble about for decades. They are free and safe from reality, from, well, real life. Abiding it seems has a lot to say to this when we realize that Jesus is calling his disciples to abide in him the day before he is crucified, the day before he dies, he tells his disciples to live in him. Abiding is not so much a safe zone. Jesus says abide in me and then twenty four hours later he is being crucified; that’s a hard thing to abide. Deep within the notion of abiding there seems to be a kind of grounding that is more than simply sticking around or staying put. I am growing to believe that what Kierkegaard called being transparently grounded in God is what it means to abide. But what do we do with a God who is so terribly earthy, so broken, so fragile? It’s great to abide in Jesus if he is some kind of transcendent ideal that doesn’t change and holds the key to all the promises of life. He makes all the promises as he is being crucified. My hope is that 10 weeks in Africa with my family will shed some light on this. People in Malawi are quite often abiding in as much joy as they are suffering. I am still not sure how that can be. Today marks the culmination of more than a year of preparation to see and ask these questions. I know I go with your blessings and your prayers. And for this I thank you. Two weeks ago we took all our children and their special friends out to lunch. After the food had come and gone and the check arrived and was satisfied, our youngest, Dave, turned to me and slapped his legs and said, “so, are we good to go here?” I smiled and looked at him and said, “yes, we are good to go.” Amen. As the time draws closer to 13 weeks of sabbatical I am finding how difficult it is to end everything for a time. Having left for no more than three weeks in the past 14 years of ministry, the idea of leaving for 13 is dramatic. Projects have all been put on pause; I am no longer in the loop; my life is to be put on hold. Yet the idea of sabbatical is just that. Stop what you are doing for a time. Wait. And then begin a new. Ending to begin. On June 7th my wife, Kathy, and I will take our two youngest children to Africa. A month later our youngest daughter and a niece will follow, and then two weeks later our eldest daughter. Altogether we will be in the city of Mzuzu for 10 weeks. The time will be spent walking, sitting, dancing, singing, and praying. The intent of each will be to see what it means to abide; what does it mean to be with others in a place without looking beyond, without preparing for the next step. My intent in seeking such a time of rest and exploration was to understand how to be in a place without looking beyond it. To abide. The more I have prepared, though, the more I have found that to abide doesn't mean to be still, or even to be in just one place. It seems to mean that wherever you are, be there. I chose Africa, and Malawi and particular, because when I have been there I felt it was hard to think beyond it. How much malerone can you take? Perhaps the most sobering moment when I prepare for Africa is buying the malaria drugs. They are tough on my system, but also a moment of pause when I remember that Africa is hard on your health. 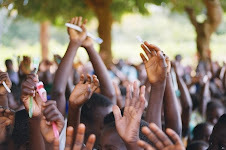 Spending three weeks asking people about malaria in Malawi two years ago has made it a pit more than hypothetical; seeing a once healthy child one year and then permanently disable the next made it personal. Yet, malaria is just a part of life in sub-Saharan Africa. I saw this when trying to suggest to a gathering of teachers that a vaccine could wipe out malaria in their lifetime. "Impossible" one teacher said and then gave me a scolding glance to suggest such thoughts are better left unsaid. Having my children take anti-malaria drugs, sleep under a bed net and have maxi deet sprayed on their clothes is something that ever reminds me of the power and blessings of the west. A bed net, maybe, is what is available to a Malawian child. In May of 2007 after a congregational vote approving the possibility, I sent an application to the Lily Endowment for a sabbatical grant. The Lily Endowment provides up to $45000 to help pastors step away for a time of no less than three months, but no more than four. The question they ask of the pastors making application is simple: what will make your heart sing? For the last three years I have been going to Malawi, Africa. The first trip was to inaugurate a school project; the second trip was a fact finding mission regarding malaria; and the third was to secure the visas for a youth choir who came to the US last summer. 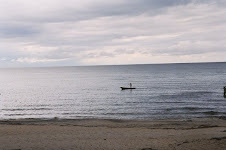 Although the trips were never more than three weeks the impact of the time in Malawi linger far longer. When I applied to the Lily Foundation I tried to convey that this impact was so significant it was becoming a challenge to interpret it to my family. They watched me throw out most of my clothes, vow to never buy shoes again, and take to grunting when asked a question. I have worked through most of these odd moments with a some grace. (I am wearing a new pair of shoes and plan to recycle my old ones.) Yet I came to feel I couldn't keep going with these experiences unless they were shared. Fortunately for me the Lily Foundation said: here is a lot of money to take your family to Africa. We don't all go at the same time, and one of our children has opted out, and a niece has jumped in, and it will mean different things to each one, but the hope is that it will be something I can share with them instead of describe to them. Getting ready to leave for Africa means having coffee and tea in Panera while we try to figure out who will feed the dog for the three months, who will cut the grass, and who will open the mail? People are wishing us well now in case they don't see us before we depart. These well wishers are making our departure more and more a reality. I've tried to suggest to people that panic is a necessary part of leaving a life behind for three months; but somehow panic is not necessarily the only part.